As much as I loved The Chalk Man, I’m quite pleased to say that The Hiding Place was a bit of a departure from the author’s debut, in a couple of amazing ways. First, I felt that it was much darker and creepier (always a plus), and second, I also greatly enjoyed the touch of the supernatural. Since C.J. Tudor’s previous novel was a straight-up suspense-thriller, this fantastical element might turn out to be a deal breaker for some, but as a speculative fiction reader by nature and habit, I welcomed it with open arms. The story follows Joe Thorne, a middle-aged school teacher who returns to his home town of Arnhill in order to settle an old score. It’s not what he wants—but it is what he must do. After hearing about a shocking murder-suicide involving a mother who brutally killed her teenage son before shooting herself, Joe fears what happened to him all those years ago is happening again. So he gets a job at the high school he used to attend, replacing the very same woman who committed the crime, and also starts renting an abandoned and dilapidated cottage in town, living in the very same house where the horror took place. All these decisions are calculated moves on Joe’s part. He has a plan, and it requires integrating himself back into the community so that he can track down a few old “friends” still living in Arnhill—those who were there on that day so long ago, when something terrible and strange happened to Joe’s beloved younger sister Annie. But Joe has plenty of secrets he’s hiding too. His gambling problems have made him some dangerous enemies since leaving Arnhill, and they’ve followed him home to join the ghosts of his past in haunting him. As expected, his return has not been met with overwhelming enthusiasm either. Joe hung out with the wrong crowd as a youth and did some pretty bad things. Being in Arnhill again means reconciling himself with the wretched teenager he once was, as well as confronting the truth of what happened to his little sister in that abandoned old mine where he and his gang discovered the real meaning of terror. In a way, The Hiding Place can be seen as a redemption story for our protagonist Joe, who finally realizes he’s run from his past long enough. Sure, there are selfish reasons for returning to Arnhill, but he’s also ready to face up to the things he’s done wrong and to try to right them. Something is rotting at the heart of his home town, which could be a combination of corruption and something more uncanny or preternatural—whatever it is, it’s a vicious cycle that needs to be stopped, even if it’s already too late for Joe and his family. Admittedly, it wasn’t until the story was well underway that I felt fully invested in it. But that’s not to say the introductory parts of this novel were slow or uninteresting, because quite the opposite is true. In fact, the opening scene is gripping both in its disturbing imagery and mysterious intensity, which sets the tone for the rest of the novel. Instead, the reason for the plot’s delayed takeoff has everything to do with how carefully and deliberately information is doled out. Joe plays all his cards close to his chest unless he absolutely has to share the details, so at the beginning, most of the story’s intrigue was driven by simply the desire to know more about him: Why is he really back in Arnhill? Why do all his old friends seem displeased with him showing up again, and what happened to cause this falling out? Why is he so evasive when it comes to certain topics in his past like his sister Annie, or the baffling circumstances behind the car accident that he was involved in when he was younger? What does any of this have to do with the gruesome murder-suicide? And what was the meaning of the puzzling message written in blood at the scene? So many questions were teased, and while they certainly kept me reading to find out more, it wasn’t until the answers started coming that I finally found myself completely drawn in. I also continue to be impressed with C.J. Tudor’s writing. While her setup may require a bit of patience, she is a natural storyteller, with an incredible way with words. I loved the measured pacing with which she revealed information, and the way she described certain things. Ultimately, I found some of the more mundane (as in earthly) character-related drama to be less interesting than the supernatural elements (others are correct in that some of them are quite reminiscent of classic Stephen King) but in the end, that’s due to the kind of reader I am and the stories I prefer. I understand some might not like the vagueness of the details, but in this particular case, I was happy that we were left with a bit of ambiguity. Overall, I liked The Hiding Place just as much—and in some respects, a little bit more—than The Chalk Man. 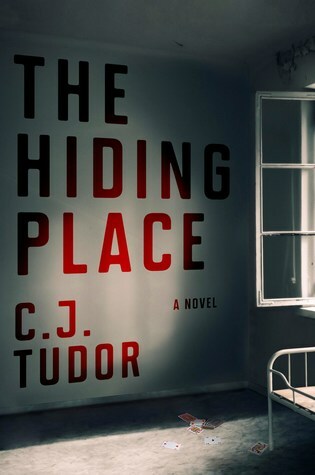 I can see Tudor becoming my new go-to author for thriller-suspense mysteries, especially if I’m looking for something with a good dose of creep factor. Audiobook Comments: In addition to the eARC, I was lucky enough to receive a listening copy of The Hiding Place audiobook narrated by award-winning voice and screen actor Richard Armitage, probably best known for his role The Hobbit. I really enjoyed this listen; I mean, if having Thorin Oakenshield read to you still isn’t enough of an appeal, his smooth mellow voice was also perfect for the role of Joe. His performance was simply captivating, an added bonus to an already engaging story. Highly recommended. This sounds great and like something I would enjoy – and I have to say that Stephen King was exactly what sprung to mind when I was reading your review. There are definitely King-y elements in this! Chalk Man had some too. I hope you enjoy! I saw the title and thought you were reviewing the non-fiction book by Corrie Tenboom about her time in the nazi prison camps. Boy was I surprised! Since I don’t read much non-fiction so I’m not very savvy on memoirs or biographies, but would you say Tenboom’s book is really famous or well-known? Because this book is pubbed under a different title in the UK (The Taking of Annie Thorne) and I wonder if preventing confusion might be the UK publisher’s reason for the name change. Tenboom’s book was famous, but I don’t know how much it has held up over time. It came out in ’71 and made a huge splash, as the first wave of holocaust deniers were just raising their heads then and Tenboom wrote it to show what her family had gone through. It might very well be why the UK version has a different name. Tenboom was from the Netherlands. I really enjoyed her other novel so I’m quite curious about this one as well! I really enjoyed The Chalk Man and I’m looking forward to getting my hands on this one! Yay, I hope you enjoy this one just as much! I’m definitely giving this author a shot at some point! Yay, do it! And it seems like she’s just getting better and better! In this era of fast-paced tv series, and equally fast-paced books, we might have lost the taste (or the patience?) for slowly building story – and yet, when we find that patience, we are usually rewarded by some intriguing developments. Not terrible at all! Like I said to another commenter, his voice was simply delicious, listening to him read was like candy for the ears lol. Oh yeah, I totally get what you mean. My favorite narrators are ones that really seem to get into the book and do all kinds of voices and read the text dynamically. Sounds like he’s a good one. I’ll have to look for this one to check him out for sure then. So I’m willing to give the author another chance after not liking Chalk Man. Your review has me hopeful. Great review!! I LOVED this one so much! !